Fig. 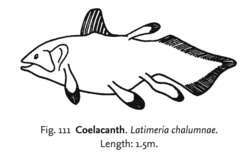 111 Coelacanth . Latimeria chalumnae. Length: 1.5m. a primitive bony fish with lobed fins (as distinct from ray fins). Almost all its relatives were freshwater fossil forms dating from the DEVONIAN PERIOD. Latimeria is a living marine form found round the Comoro Islands off Southeast Africa and collected for the first time in 1938. It is remarkable in that it has remained almost unchanged from its ancestors in the lower CARBONIFEROUS PERIOD, that existed more than 300 million years ago.